Ntel is set to commence operation soon and one of the questions most people have been asking is where they can get the Ntel sim card and also the price. The good thing is that Ntel is not going to sell the sim card as they will be giving it out free of charge. Aside that, you are also allowed to reserve up to 5 personalized numbers of your choice from their range of available numbers. According to Ntel, the network will be launched in Lagos, Port Harcourt and Abuja. The Sims will be available for collection after the official launching and also anybody from any state in Nigeria can reserve for the sim card but you can only receive it in Lagos, Port Harcourt and Abuja. How To Reserve Your Ntel Number. ==> Provide your name, Number(current no) and E-mail address. ==> Select pick up location and submit. ==> Type your preferred no from the range and click on "check availability" to know if the know is available (you can reserve as much as 5 nos). ==> After confirming that the nos you selcted are available, Click on “reserve now” . ==> On completion of your reservation, ntel will send you an email confirming the details of numbers reserved against your name. subscription on your new number. 1. Where can I find out more information about ntel’s products and services? 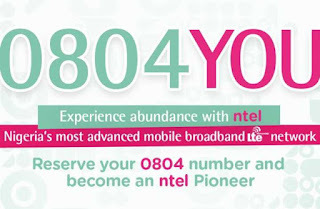 More information about ntel’s products and services will be made available at ntel.com.ng very soon. 2. How much will it cost to reserve an ntel number? No fees apply to the reservation of ntel mobile telephone numbers. 3. What do ntel numbers start with? Our initial number range starts with 0804. 4. Can I reserve any number I choose? You can reserve any number of your choice that is currently available. 5. How many ntel mobile numbers may I reserve? Each individual is entitled to reserve up to a maximum of five (5) numbers against his/her personal identity. 6. When will I be able to use my new ntel number? When the ntel network is launched. 7. When will ntel’s LTE network be launched? ntel’s LTE network will be launched shortly. Once the launch is announced, customers who have reserved numbers will be contacted and notified to visit the nearest ntel sales centre to be SIM-activated and enrolled as customers. 8. Why can’t I find the number I am looking for? Each ntel number is available on a ‘first come, first served’ basis, so the earlier you reserve your own selection, the better the chances that you will get your first choice/s. 9. For how long will the ntel number(s) I have reserved be retained for my eventual SIM activation? 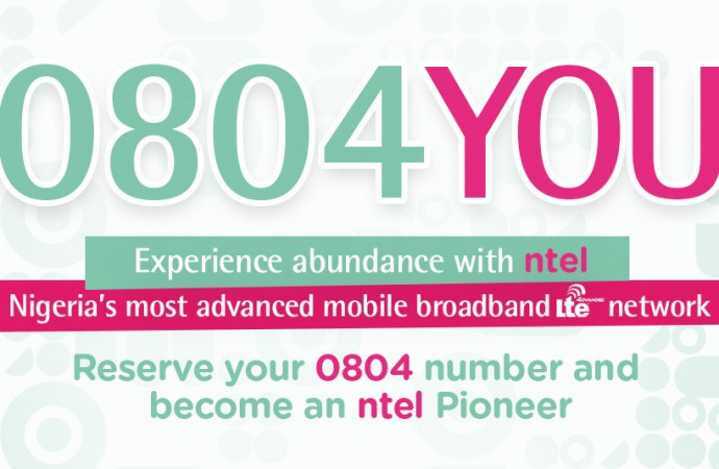 Your new ntel number will be set aside 90 days, from the date of our commercial launch. Reserved ntel numbers that are not activated within this 90-day period (from the date of our commercial launch) will be returned to our number range pool and made available, once again, for new reservations. 10. What requirements must I fulfil to reserve an ntel mobile number? 11. How can I SIM activate my reserved ntel number? Simply visit one of ntel’s new sales centres(locations will be published widely and directly to prospective customers who have registered ntel numbers). Present the physical or electronic versions of your reservation’s confirmation along with matching original ID details and you will be SIM-activated and enrolled as a customer on ntel’s LTE network. 12. Can people residing outside Lagos, Abuja and Port Harcourt reserve an ntel number? Yes, this number reservation opportunity is available across Nigeria. However, at its original launch ntel’s services will be available in Lagos, Abuja and Port Harcourt and while customers outside these areas may SIM activate their ntel number(s), they will have to wait a little longer to use ntel’s services in their local areas. 13. What is an LTE network? An LTE network is the latest generation of mobile network that features the most advanced technology for mobile communications. LTE is designed to carry large amounts of data associated with modern communications at high-speed with an emphasis on video traffic, the most demanding category of traffic on today’s mobile networks. LTE features super fast call connect time, using voice over LTE, and high-speed access to the Internet. These features enable a richer range of products and services to be provided to mobile customers, including video-based services not previously available to mobile customers in Nigeria. 14. I do not have an email address. What can I do? A valid email account is required for us to send your confirmation details. Notification of successful number reservations will also be sent to you via email immediately after submission of your request. If you don’t have an email address, you can register for an account at any of the free email sites on the Internet such as Gmail, Yahoo, etc. If you have any question, then feel free to drop it in the comment box below. Tried several times but It won't do. Am I the only one facing this? ?